Rory McIlroy was left to rue a series of missed putts as he failed to make any significant move in a frustrating third round at the US Open. McIlroy hit a level-par 70 to remain on four over which left him eight behind leaders Jason Day, Dustin Johnson, Branden Grace and Jordan Spieth. The world number one, 26, failed to take several birdie chances despite another superb ball-striking round. Shane Lowry is sharing fifth place three shots off the pace after a 70. 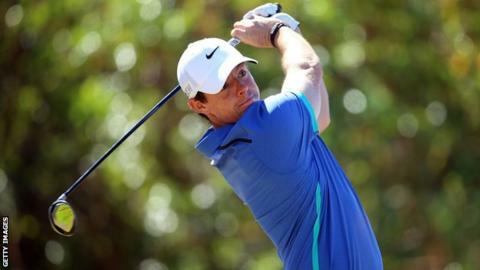 McIlroy only made the cut by a single shot as two rounds of 72 left him nine shots adrift at the halfway stage. Birdies at the second and seventh got the Northern Irishman off to a good start but bogeys at the 11th and 15th saw him drop down the leaderboard. Playing in perfect conditions at Chambers Bay, McIlroy needed a barnstorming round to revive his flagging hopes of securing a second US Open title and a fifth major success. The world number one was two under for his first seven holes and thereafter created several birdie chances, but passed up all of them. McIlroy failed to take advantage of the par-five eighth and after a brilliant second shot, lipped out from three feet for a birdie on the 10th. He then three-putted the 11th to drop a shot and missed opportunities for birdies at the 12th, 13th and 14th holes, before bogeying the 15th to go back to level for his round. The reigning Open champion missed another birdie putt at the 17th following an exquisite iron shot, but salvaged a par at the last after rolling the ball in from 10 feet. "That's probably the best I've struck the ball all year from tee to green and I feel I could have gone a lot lower," said McIlroy after his round. "I gave myself so many chances from inside 15 feet and didn't make one of them. Once you miss a couple it gets into your head and you make some tentative strokes. "It's a battle, a test - you have to stay patient and eventually one went in at the end."